This light truck and SUV tire features a wide center pattern rib for excellent steering response on wet or dry surfaces, with wide pattern blocks at the shoulder and four main longitudinal grooves for excellent drainage. The narrow grooves on the MaxTrac A/T improve traction and provide excellent braking performance and steering response in wet, dry or wintry conditions. Saffiro uses advanced pattern noise analysis for a computer-tuned design of pattern and pitch for minimized noise levels. Wide center pattern rib ensures excellent steering response on wet and dry road. Wide pattern blocks on shoulder improve steering response. Four main continuous longitudinal grooves ensure excellent drainage. Narrow grooves improve the grip property, steering response, braking performance and traction in wet, dry and snowy conditions. Advanced pattern noise analysis software design, optimizes the pattern block pitch arrangement and minimizes noise levels. Wide tread blocks ensure enough contact area and improve grip and performance. 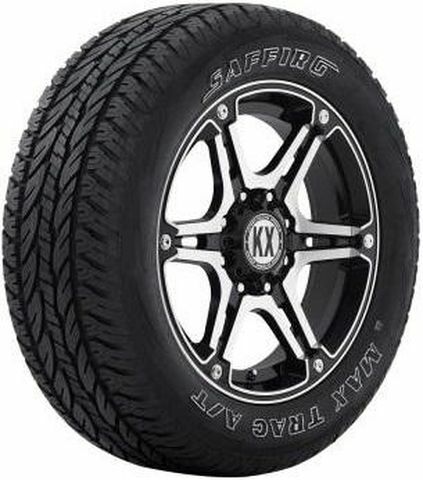 Purchase includes the Saffiro MaxTrac A/T tire only. The wheel rim shown in the picture is not included. Picture provided is a stock picture from the manufacturer and may or may not reflect the actual product being ordered. All Saffiro MaxTrac A/T tires are continuously developing with manufactured improvements. With that said, Simple Tire and the manufacturers have the right to change these tire specifications at any time without notice or obligation. Please Note: Specifications of the Saffiro MaxTrac A/T tires shown above are listed to be as accurate as possible based on the information provided to us by Saffiro tires. Great tires, quite on freeway so far pleased with ride they preform, drove them it lightly rainy day, no problems, have not driven in hard down pour yet, but cut through standing road water with no hydroplaning tires look good also.